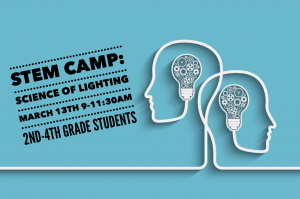 Join us at Roller City for a morning of hands-on learning about the science of lighting and various STEM concepts, as well as roller skating fun! This camp is designed for students in 2nd, 3rd, and 4th Grade. Cost is $12 per student, and parents are encouraged to attend at no cost. 9-10am: Students will learn about the speed of light and how light travels. Students will also learn the exciting effects of light with the use of reflection and refraction. Very interactive and hands-on! STEM lesson will be taught by a NIACC STEM Professor. 10am-11:30am: Roller skating at Roller City! Ready to attend? Purchase tickets below! For any questions, please contact Tyler at myrollercity@gmail.com or 641-423-2000. We hope to see you on March 13th!